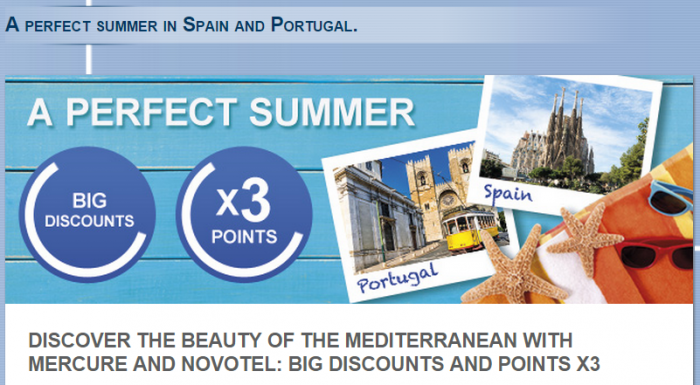 Le Club Accorhotels has launched a triple points offer with up to 40% off for Mercure and Novotel stays in Spain and Portugal between July 3 – September 6, 2015. The offer is valid when you choose “Sweet Escape” rate at Mercure and “Perfect Break” rate at Novotel hotels. The offer is valid for bookings made July 1 – September 4. Note that the dates on the Accor’s web page are contradictory what are listed on T&C’s. I believe that the T&C’s are correct. Whether this offer makes sense is entirely dependent of the rates offer under these two rate plans. Remember that the booking window won’t open before early July. 1. The terms and conditions of the program Le Club Accorhotels applies to “Sweet Escape” at Mercure and “Perfect break” at Novotel offers in Spain and Portugal. 2 This offer is valid for stays between 03/07/2015 and 06/09/2014 in one of the Novotel and Mercure hotels participating in the offer and booked with the between 01/07/2015 and 04/09/2015. 3. The offer allows members of the loyalty program Club Accorhotels regardless of their status, to benefit from a gain points X3 points in one of the participating hotels in Spain andPortugal.